A description of Freckleton from 1934. THIS township has a large village, pleasantly situated on the north bank of the Ribble, 2½ miles south from Kirkham, and 8 miles west from Preston. It is in the Fylde parliamentary division, and in the Fylde county council division and Union. The parish council consists of nine members. HOLY TRINITY CHURCH was erected in 1839. It is a plain brick edifice, in the perpendicular style, and consists of nave and chancel, with a western tower and small spire containing one bell. The east window, of stained glass, is to the memory of Mr. Green, and a handsome brass tablet has been erected on the north wall in memory of a late vicar, Rev. Walter Scott. 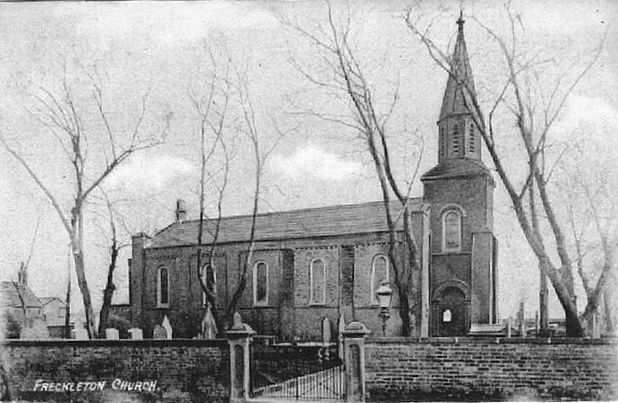 In 1900 the church was enlarged. There are 300 sittings, 150 of which are free. The benefice is a vicarage of the annual value of £300, in the patronage of the Bishop of Blackburn. Rev. J. W. Broadbent, vicar. The NATIONAL Schools were enlarged in 1901, at a cost of £400. The METHODIST CHAPEL, which supersedes one built in 1840, is a very neat edifice, built at a cost of £330. There is sitting accommodation for 300 persons. Another Chapel, seating about 266 persons, is a neat Gothic building of patent brick, with stone dressings, having a graceful spire. It was designed by Messrs. Mould, of Manchester, and the contractor was Mr. John Gardner, of Kirkham. and the cost of erection was £1,200. In the village is a Church Room, given by W. S. Hodgson, Esq. A School-Chapel, dedicated to the Holy Family, was erected by the Catholics of Freckleton and Warton, was opened on the 30th September, 1899. The building has accommodation for about 250 worshippers, and the cost of erection was over £500. The mission is served by the Rev. Francis E. Hayward. A cotton mill gives employment to a considerable number of people. The township contains 2,409 acres, and the rateable value is £5,512. The population in 1851 was 968 ; 1861, 879 ; 1871, 930 ; 1881, 1,134 ; 1891, 1,306 ; 1901, 1,239 ; 1911, 1,312 ; and 1921, 1,438. Parlsh Council.—S. J. Barlow (chairman), Walter Rawsthorne, M. Arm. strong, Edward Sudell, John Kirby, James Lonsdale, E. Iddon, Rev. J. W . Broadbent and G. W. Rigby. Rating Officer : W. Banks. Rural District Councillor : W. Rawsthorne. Post and Money Order Office at Mr. Wm. Bank's. Letters arrive from Preston, via Kirkham, 5.10 a.m. and 5-40 p.m., and are despatched at 9-10 a.m., 3-45 p.m. and 7-10 p.m.